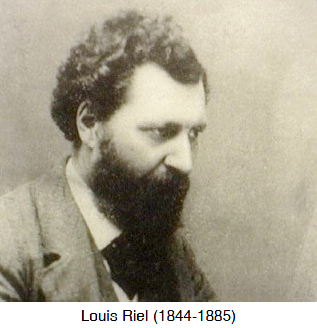 Louis Riel was a Métis born in the Red River area in 1844. He was educated in Montreal and fluent in both English and French. When settlers and surveyors started to move in and divide up the lands Canada was buying from the Hudson's Bay Company, Riel quickly rose to be spokesman for the Métis whose lands were being appropriated. Historians vary widely on their assessment of Riel. Some call him a madman. Some say he was simply dedicated to the survival of his people. All agree that he was an eloquent and passionate leader. Riel was forced to flee to the United States in 1870 to escape arrest for the execution of an Irish Protestant, Thomas Scott. Although he was elected to Parliament three times, he never actually took his seat. He worked as a school teacher and had increasing visions of himself as a prophet, chosen by God. His beliefs worried his family so much that they sent him to a lunatic asylum outside Montreal for awhile. In June 1884 Métis leader Gabriel Dumont went to Montana to persuade Riel to return and lead his people in another battle. The traditional life of the Métis was again threatened, this time by the westward expansion of the railway. 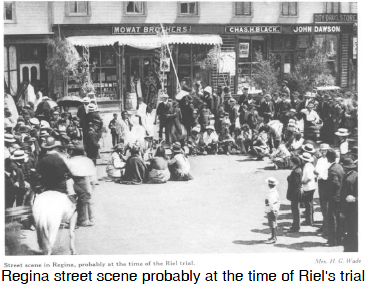 After the Northwest Rebellion of 1885, Riel was arrested, tried and finally executed. Because of that he has become something of a martyr in Canadian history. His story serves to show just how insensitive Macdonald's government was to the needs of the people whose paths dared to cross the relentless westward progression of the railway.